I had no clue I had as much spray paint as I did until I made this project. 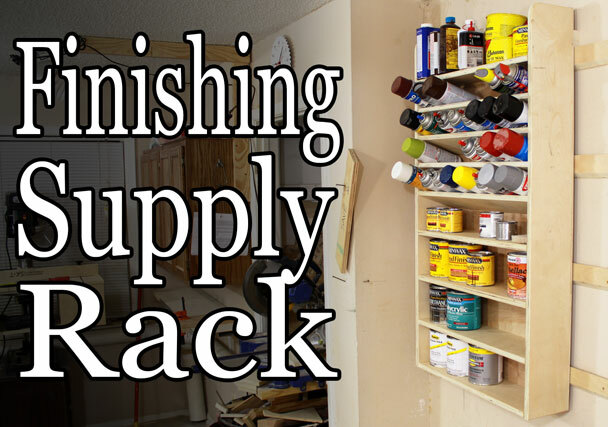 Traditionally I stored my spray cans and other finishing supplies in standard kitchen size upper cabinets. Storing them in deep cabinets is a pain in the behind because it’s so inconvenient to go through them all and see what you actually have. Apparently I missed a few cans in the shuffle too as I have several more cans of brown and black than I thought. This rack is one of many future french cleat projects for the shop. I love French cleats. The system is incredibly easy and adapts to future change instantly. For those who are unfamiliar with a French cleat system it is nothing more than a small strip of wood attached to the wall with typically a 45 degree bevel on the top side which forms a hook. An identical strip of wood is fastened to the back side of whatever you are trying to hang but this time with the 45 degree bevel facing down and out to form a matching hook. Then you can simply hook whatever it is you are working with to the wall. The advantage of this is you never have to hold your piece up to the wall with one hand and try to fasten it with the other. All the work is done before it hits the wall. Another great benefit of a French cleat system is that if you decide to change the location of your cabinet you can just pick it up and move it wherever you have a cleat on the wall. The construction of this rack is done with pocket hole screws. 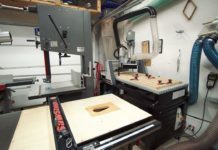 If you do not have a pocket hole jig (affiliate link) I strongly urge you to look into them. I’ve had mine for several years now and love it. Most projects on this site have pocket hole screws in them. It’s just so quick and easy to make a strong joint. Either 48″x48″ of 3/4″ plywood OR four 1x6x96″ boards for the structure. 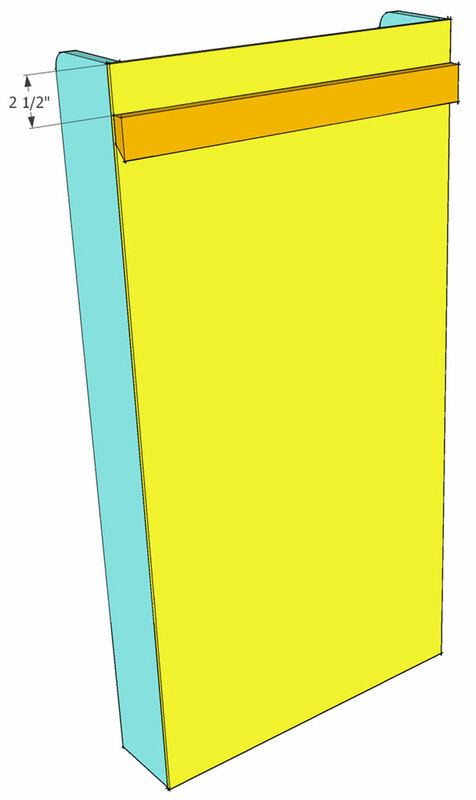 24″x48″ of 1/4″ plywood for the back. 36 1-1/4″ pocket hole screws. A handful of brad nails or screws to attach the back panel. Mark the location of the shelves on each side piece. Remember to flip the measurements on one side so you don’t end up with two right or two left sides. After everything is marked out use glue and pocket hole screws to secure all the shelves to one side. Lay the side down horizontally for this step. If you are concerned with seeing the pocket holes align the horizontal shelves with them on bottom and the angled shelves with them on top. 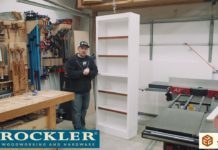 With all the shelves attached to one side add glue to all of the opposite ends of the shelves and lay the other side on top or do like I did in the video and flip the entire piece over on top of the other side. 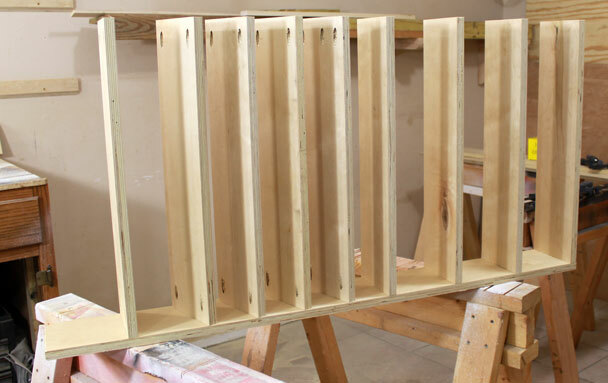 Move the shelves as needed to line up with the layout lines and secure them with pocket hole screws. Use glue and either brad nails or screws to attach the back. If you chose solid wood for your shelving and side materials you may want to skip the glue to allow for expansion and contraction. After that, add the cleat near the top. The spacing is up to you but I have included the spacing measurement that I will be using. You may also need to add a small scrap piece of 3/4” material near the bottom of the back to keep the project vertical. 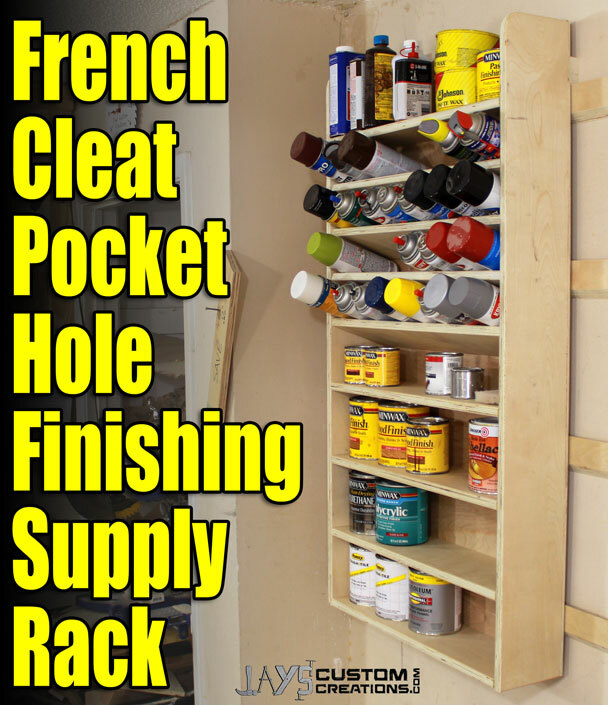 I have two more rows of french cleats on the wall so I do not need to add the lower spacer. Either way, you should have enough scrap from the shopping list to add one if needed. favourite part was the nailing in unison with the background music lol. Nice editing!!! Really well done video and a great project. 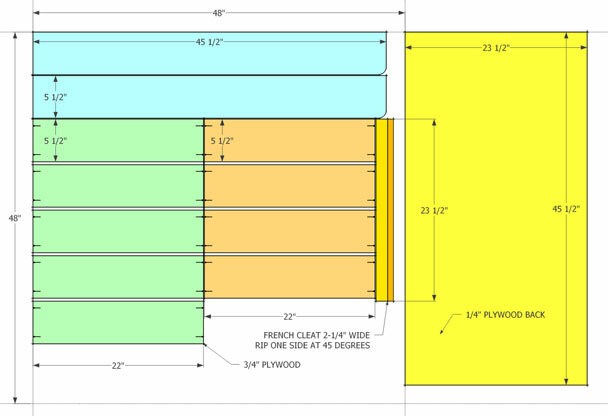 I like that the measurements are configured for using standard 2X6. Well thought out. Thanks! I’d stick with a 1×6 though. A 2×6 may add a lot of weight! Thanks for the plans, I just built one and I love it! granted mines not that pretty since its my 1st project but very functional. 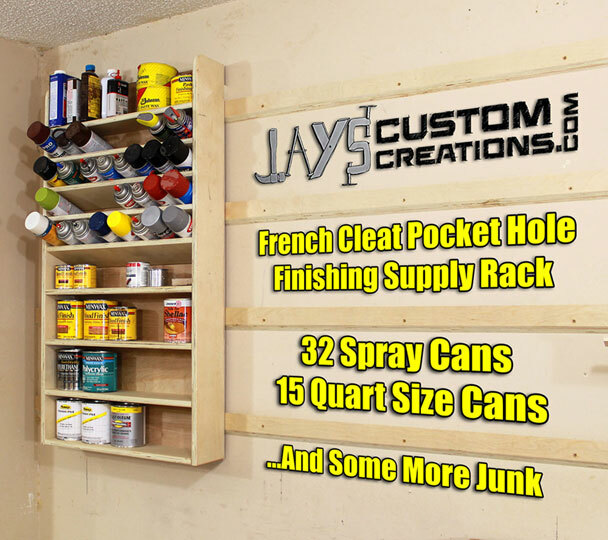 Jay never really understood the French Cleat system until viewing this video thanks, one item I like about your site is the very precise way you present the material, Kudo’s . great stuff Jay! 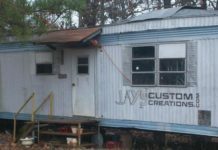 In the process of building a new shop behind my garage. I am going to be buying some plans that I am going to put to use. Keep up the good work. I have to say your site is better then some out there. how far apart are the cleats on the wall? and did you use 3/4 tick wood on the wall?